The novel "Star Trek- Inception" attempts to tell the backstory of these 2 doomed romances, filling in an unexplored gap in the characters' lives. The story of their relationships is set against the backdrop of the Inception program (a precursor to the Genesis experiment), to which both Carol Marcus and Leila Kalomi are contributing. A crazed space environmentalist named Thaddeus Kent wants to shut Inception down by any means necessary, and it will take the combined efforts of Kirk and Spock to make sure that Marcus and Kalomi's work doesn't turn into a galactic disaster. What the book gets right is the personification of the characters. Kirk and Spock are just as they should be, with Spock's unfamiliarity with emotion and Kirk's confident nature being showcased as the core of their characters. What's truly impressive though is the way the authors handle Marcus and Kalomi. While existing canon doesn't provide a whole lot on these two, the authors manage to capture their personalities quite well, even intertwining their histories in a completely believable manner. 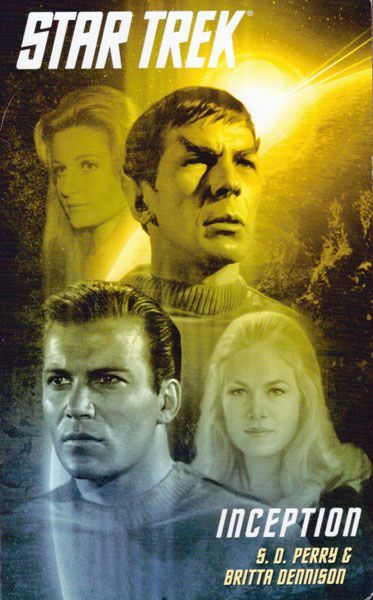 The authors also manage to get all 4 main players working together while not actually having Kirk and Spock cross paths, thereby avoiding any possible hiccups in the characters' histories. Unfortunately, there is a lot that didn't work for me as well. First, there's the main villain of the piece: Thaddeus Kent. A great deal of the book is spent exploring his character and motivations. So much so in fact, that I feel the main characters get slighted in favor of learning more about why Kent does what he does. While I understand the need for a reader to identify with what motivates a villain, I felt that the exploration of his character was needlessly long, especially when you consider that the book is trying to cover two relationships in fairly short story. That's where my other main problem comes in: There isn't enough of either the Kirk/ Carol or Spock/ Leila relationships to fulfill any preconceived questions that the reader might have. I don't think I'm alone in putting the question of how Kirk left a pregnant Marcus as my main question in his and Carol's relationship. The entire book teases us with Carol's inability to reveal the pregnancy to Jim, awaiting the moment when all will be revealed and Kirk will make the decision to leave. Sadly, it never happens. The book ties up the Kent struggle in fairly short order, but the pregnancy thread is just left dangling out there. Even worse than that in my eyes is the way the Leila/ Spock relationship is handled. While one could see how Leila's feelings in "This side Of Paradise" could have been inspired by the events shown here, I don't see anything on Spock's side that would have caused the emotional reaction shown in that episode. I feel like the authors could have played a bit more towards Spock's inability to hide his emotions at this earlier stage in his life, showing a connection with Leila that would cause the stirring of emotions we witness in TSOP. It just feels like a lost opportunity all around. So are Kirk and Spock in Starfleet separately and don't meet or is this before Starfleet for both? Depending on how you look at the new movie (either alternate Universe or a completely changed TOS time line) Kirk and Spock now meet right in the Academy (an idea I loathe, BTW). Of course, I am blocking out the new movie from conscious memory. The simple style of the tag heuer replica is often are as complex mechanical rolex replica pleasing charm, but simply that its style is equally intriguing. Simple style rolex replica uk like the spring rain, and silent, can cause the infinite daydream and fun people. Today we recommend three men watch, and everyone together to taste the charm of rolex replica uk simplicity. So, when a group of friends to ask me what replica watches to send to their most beloved man. Affirmed, We had been a little amazed through the style after replica watches do watch it, despite the fact that I already been set up with regard to some thing having a mentioned objective associated with rolex replica uk as well as mold breaking.